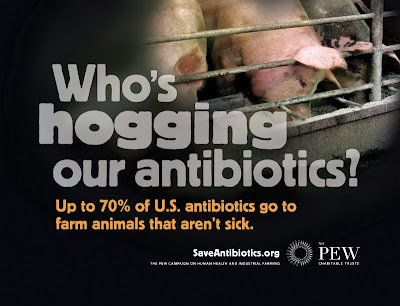 I was gobsmacked to discover today, a few days late, that the Pew Campaign on Human Health and Industrial Farming (authors of the report discussed here) have launched a marvelously in-your-face series of ads in Washington DC, aimed at bringing the issue of antibiotic use in farm animals to people who might not think about it. The ads have been placed in the Capitol South and Union Station Metro stops, which are the stops that bracket Capitol Hill, and in Metro cars on the red and blue/orange line trains, which are the main commuter trains down to the Hill. In other words, they’ve been made to be the morning reading of the people most engaged in the health reform debate right now — and if you think those folks are not thinking about healthcare spending and the growth of antibiotic resistance, well, umm, oh never mind. The American Medical Association, the American Academy of Pediatrics and other leading medical groups agree that the growth of bacterial infections resistant to antibiotic treatment is a looming public health challenge. The groups also agree the misuse of antibiotics on industrial animal farms plays a significant role in this crisis. While antibiotics are prescribed to people for short-term disease treatment, these same critically important drugs—like tetracycline, erythromycin and ciproflaxin—are fed in low doses to large herds or flocks daily, often for the lifespan of the animal. This creates ideal conditions for the breeding of new and dangerous antibiotic-resistant bacteria. For statistics and arguments, along with more images — cows! chickens! pills! — go to the site of the commission’s campaign, Save Antibiotics. 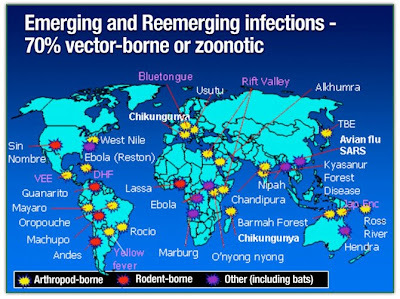 Via Emerging Infectious Diseases, the open-access journal published by the CDC (Do I have to keep telling you to read it? It’s free. It’s good. Your tax dollars pay for it. ), comes a report of surveillance for MRSA colonization of pig-farm workers, conducted in Belgium by researchers from Erasmus Hospital of the Free University of Brussels, and the Veterinary and Agrochemical Research Centre of Brussels. The group persuaded 127 farm workers on 49 farms to be tested for colonization, or asymptomatic carriage, of MRSA; at the same time, they tested 30 randomly selected pigs on each farm. They found very high rates of colonization, higher than have been found in patients in hospitals or residents of nursing homes: 38% of the farm workers carried MRSA ST398, the pig strain (plus, an additional 17% carried various strains of MSSA, drug-susceptible staph). There was a clear association between colonized farmers and colonized pigs: Out of 1500 pigs sampled, 44% carried ST398 — and half of the workers on farms with colonized pigs were colonized also, compared to only 3% of workers on farms where pigs did not carry the bug. In a bit of good news, the researchers found only one farm worker who had suffered any MRSA disease from ST398, a man with a lesion on his hand. There was no invasive disease, though ST398 has been associated in the past with pneumonia and endocarditis. Workers were more likely to acquire the bug if they had regular contact with pigs, dogs or horses, which makes intuitive sense. But in an odd finding, their odds of acquiring ST398 did not go down if they wore protective clothing — which is to say, aprons, gloves and masks did not protect them from picking up the bug, leading the researchers to wonder whether airborne spread or contaminated surfaces are playing a role in transmission. So what does this mean? The lack of invasive disease in this population must be good news; and it’s consistent with a number of papers that have reported low rates of disease from ST398 even when colonization is present. But to me, the high rate of colonization must be bad news. The more of this bug there is (and every researcher who looks for it seems to find it), the more chance there is of the bug adapting in an unpredictable — potentialy more resistant, potentially more virulent — way. If that did happen, it could well go undetected for a while — because as swine flu has been teaching us, disease surveillance in animals is patchy at best, and new pathogens can and do arise and ciruclate for years before being detected. For more on the paucity of surveillance in animals, see my CIDRAP colleague Lisa Schnirring’s story here. For a complete archive of posts on “pig MRSA” ST398, go here. The cite is: Denis O, Suetens C, Hallin M, Catry B, Ramboer I, Dispas M, et al. Methicillin-resistant Staphylococcus aureus ST398 in swine farm personnel, Belgium. Emerg Infect Dis. 2009 Jul; [Epub ahead of print] DOI: 10.3201/eid1507.080652. and promotion of both vaccine research and point-of-care diagnostics. Hear, hear to Baroness Masham of Ilton for bringing it up. Lord Hoyle: My Lords, I thank the noble Lord for that reply, although there is more than a whiff of hypocrisy about it. After all, I and many others on all sides of the House have argued that it should not be a matter of price. We have urged the British consumer to buy British bacon because of the higher welfare standards that are applied in this country. Will the noble Lord also take into account the presence in Dutch bacon of a deadly form of MRSA, ST398, which can cause skin infection, heart trouble and pneumonia? Is he not putting people in this country at risk, particularly as the strain has passed from animals to humans? Indeed, when Dutch farmers go into hospital, they go into isolation. Why is he putting the British consumer and those who buy bacon in this House at risk in this way? The discussion quickly devolves into foolishness about British Tomato Week — but if you read carefully, you’ll see that behind the silliness, there are serious issues at stake: animal welfare, farming standards, truth in labeling (the Lord Bishop of Exeter advances the very newsworthy claim that pork imported from other countries is subsequently labeled “British” only because it is packaged in the UK) and movement of zoonotic pathogens across national borders thanks to globalized trade. As far as MRSA is concerned, I read the article in, I think, the Daily Express a couple of weeks ago. I do not think that it has been followed up by anybody else. Apparently the Lord’s staff have not been keeping up, since MRSA in pigs in the EU has been covered by the Daily Mail, the Independent, comprehensively by the Soil Association, and by, ahem, us. There’s a letter in the upcoming issue of Emerging Infectious Diseases (hat tip Pat Gardiner) alerting the medical community that “pig MRSA” ST398 has been found in Italy, adding t the steadily enlarging list of countries where this strain has been identified. Based on clinical and magnetic resonance imaging data, the diagnosis was cellulitis, pyomyositis, and pelvic multiloculated abscess of the buttock. A needle aspiration of the abscess, guided by computed tomography, was performed. Because of persistent fever (38.5°C), oral ciprofloxacin was added to the patient’s treatment regimen on day 3. Blood and abscess cultures yielded MRSA that was sensitive to glycopeptides, rifampin, linezolid, gentamicin, and mupirocin and resistant to co-trimoxazole, macrolides, clindamycin, and fluoroquinolones. After treatment was switched to vancomycin plus rifampin, the patient’s general condition improved; he was discharged from the hospital after 24 days. Two fellow workers were colonized with S. aureus, 1 with methicillin-sensitive S. aureus (MSSA) and the other with MRSA. The pig farm, a farrow-to-finish production farm with 3,500 pigs, was screened for MRSA … Dust swabs were taken from 5 areas of the farm; 7 MRSA isolates were detected. The isolate from the patient belonged to spa type t899, was ST398, carried an SCCmec type IVa cassette, and was PVL negative. The isolate from the MRSA-colonized worker was a t108 strain carrying SCCmec type V. The isolate from the MSSA-colonized worker was identified as t899. The dust swabs yielded 7 isolates: 2 belonged to t899 and carried SCCmec IVa; 5 belonged to t108 and carryied SCCmec V. The isolates obtained from the patient, farrowing area 7, and gestation area 1 were indistinguishable (i.e., same spa type, SCCmec type, and ST profile; Table), thus confirming the animal origin of transmission. None of these are good news. …attention should be given to the emergence of MRSA strains among animals, and continuous surveillance in humans should monitor the extent of disease from MRSA ST398, especially in areas of intensive animal farming. Collaboration between infectious disease specialists, microbiologists, and epidemiologists, on both the human and the veterinary sides, should be strengthened and readied for appropriate action whenever complex, zoonotic, public health issues occur. One, from the Austrian National Reference Center for Nosocomial Infections, reports that out of 1,098 isolates from infected or colonized hospital patients collected between 2006 and 2008, 21 were ST398, the “pig strain” that we have talked so much about here. Of the 21, 15 were colonized and 5 had actual infections (one person lost to followup, apparently); of the 5 infections, 4 were minor, and one was a very serious infection in a knee replacement in a 64-year-old farmer. In a separate piece of math that is not fully explained, the researchers note that the prevalence of ST398 in Austria has risen to 2.5% of MRSA isolations, from 1.3% at the end of 2006 — close to double, and especially rapid given that Austria’s very first ST398 sample was found during 2006. The second paper is much more complex; it deals with the prevalence of multiple MRSA strains in the cross-border region where Germany, Belgium and the Netherlands bump up. (Apparently EU bureaucracy calls an area like this a “Euregio.” Ah, jargon. This is the EMR, the Euregio Meuse-Rhin.) The concern here is that MRSA prevalence is very different in different EU countries; in the Netherlands, which has an active surveillance “search and destroy” policy in its hospitals, MRSA represents only 0.6% of all staph — but the rates are 13.8% in Germany and 23.6% in Belgium, which either do not do active surveillance or began to much more recently. So as people move freely across borders, from a high-prevalence area to a low-prevalence one, they could bring a resistant bug with them that then could find a foothold because there is an open ecological niche. This study analyzed 257 MRSA isolates from hospitals in the border region that were collected between July 2005 and April 2006: 44 from Belgium, 92 from Germany, and 121 from the Netherlands. Of the Dutch isolates, according to typing, 12 (10%) were ST398. These were all from patients who were identified as colonized when they checked into hospitals practicing “search and destroy”; none represented actual infections. So, what does this tell us? A couple of things, I think. First, it documents the continued presence of ST398 in Europe; in other words, it wasn’t a blip and doesn’t appear to be going away. Second, it underlines both that you find it when you look for it, and also that it remains a small portion of the overall MRSA picture. But, we immediately have to add, it’s a small portion that wasn’t present at all just a few years ago. And it should underline that what we need, and are not getting in this country or in Europe, is much more comprehensive surveillance and research to understand ST398’s place in MRSA’s natural history, so that we can understand where it is only an emerging disease, or truly an emerging threat. Important news for anyone concerned about the spread of “pig MRSA” ST398: Rep. Louise Slaughter (D-NY) and Sen. Edward Kennedy (D-MA) have introduced a bill that would restrict important classes of antibiotics for use against disease only, taking them out of the realm of subtherapeutic use or growth promotion in agriculture. The bill would allow the use of the antibiotic classes for disease in animals as well as in humans; the intent is to preserve the drugs’ effectiveness for as long as possible. The text of the bill, the Preservation of Antibiotics for Medical Treatment Act of 2009, is here. A Reuters story in which Slaughter predicts the bill will have a difficult time is here; she has introduced it several times in the past decade, but it has never made it through. Support from the Pew Commission on Industrial Farm Animal Production is here. An earlier version was supported by the American Academy of Family Physicians here. The National Pork Producers’ Council’s response is here. So, constant readers, I have wrestled another chapter to the ground — and thus have a few minutes’ breathing space to talk about a story that some of you have asked about privately. I’ve been wondering whether to post on this, because the entire episode is in the book, and I don’t want to scoop myself. But it’s so interesting, and so sad, that it seems worthwhile. So, the brief synopsis: In late January 2008, the San Diego Zoo’s Wild Animal Park noticed that a baby African elephant, born in late November 2007, had broken out in pustules on her ear, neck, elbow and leg. Three of her caretakers had skin infections also. The zoo launched an investigation, assisted by a CDC Epidemic Intelligence Service officer who is assigned to California; they were concerned that the caretakers had unknowingly picked up a disease from the baby, who had been born early, was not thriving and was being intensively hand-reared by the zoo staff. But in fact, it was more complicated than that. The pustules were MRSA, of course — but they were not ST 398, the animal strain that we have talked about so much here. Instead, they were USA300, the community-associated human strain that has zoomed to dominance all over the country. But there was no MRSA in the elephant herd, which the baby had not had contact with since late December. The reconstructed chain of transmission looked more like this: from an unknowingly colonized human to the baby elephant, who was medically fragile and had been isolated from her herd, and then from the elephant to the rest of the human “herd” who were caring for her. The strain involved was USA300, In the end, five human infections and three colonizations were laboratory-confirmed, and 15 other infections were suspected but not confirmed. So what does this tell us? Well, for zoo personnel, it tells them what to do for next time: More complete infection control especially around vulnerable animals. For microbiologists, it’s an expansion of MRSA’s range: No one had ever seen it in an elephant before. And for the rest of us, it suggests, one more time, how extremely adaptive and inventive MRSA is, and that we should never underestimate its ability to surprise. Constant readers: Fresh from the journal Emerging Infectious Diseases — posted AOP (electronic publication/ahead of print) this afternoon — comes more news of MRSA ST 398, the “pig strain,” in food animals. This time, it’s chickens, in Belgium. The authors (from Ghent University and the Veterinary and Agrochemical Research Center in Brussels) took swabs from living chickens — laying hens and broilers — from 24 farms, 50 layers and 75 broilers total; one broiler-raising farm was sampled twice. They found no MRSA in the layers, which is important for reasons I’ll get to in a moment, and ST 398 in 8 broilers. From each chicken, they took two samples, nasal and cloacal, and in the 8 positive chickens, they got 15 MRSA isolations; one cloacal swab was negative. Of the positive chickens, several (I deduce three, but the math is a bit cloudy) were spread across the two visits to the farm that was sampled twice. Since chicken farms are depopulated between batches — yes, just what it sounds like, farms sell/kill all the birds and clean the place — that finding suggests that MRSA is persisting in the environment on that farm. Important point: This strain was ST 398, which we here have been calling the pig strain from many previous findings, most of them in pigs. However, ST 398 is an identification using a particular technique called MLST (multi-locus sequence typing), which is used for this strain because the standard typing method, PFGE (pulsed-field gel electrophoresis), did not return a readable result when the strain was first identfied back in 2004. (Trivia: That’s why the initial reports of this strain called it NT, for “nontypeable.”) It’s becoming increasingly clear, though, that ST 398 is actually a category, not a single strain. And within that category, today’s research is a new find: a strain with the unusual spa type t1456, which has only been found 10 times in the past three years, in Germany and the Netherlands, not in Belgium. The author suggest that this particular strain may be adapting to poultry in the same manner that the ST 398 we have been talking about (different spa type — sorry, I will have to look it up) has adapted to pigs. So, as before: Why do we care? We care for two reasons: First, because since this strain is in a food animal, the possibility exists that it could contaminate the chickens’ meat during slaughter and pass to humans. As has happened with some ST 398, the humans could be only colonized, and not become ill. But, second, any increase in colonization is a bad thing: The more strains out there, the greater the chance that they will exchange virulence and resistance factors and become something unpredictable. Now, about those layers, here’s an interesting factor that the authors call out in their paper: Layers, unlike broilers, do not receive antibiotics. The layers did not carry MRSA. The broilers did. It’s a pretty potent argument, in case anyone needed convincing, of the effect of the selective pressure that antibiotic use in food animals exerts on these strains.